We rearranged Wife's desk today. Our desks are homemade, with a fixed monitor shelf and an adjustable main shelf for the keyboard and such. Hers has standard outlet boxes wired in. The desks were built to fit a different area with a little more space, so we shortened her main shelf by 3 inches to fit the new room a bit better. While we had everything out, we decided to rearrange cords. Velcro cable ties are wonderful. These are strips of velcro with hook on one side, loop on the other. I've seen them in the garden department, at Harbor Freight, and at geek supply places. We stuck a bunch of big cup hooks under the desk for cable management, and occasionally a velcro tie to bundle the wires together. Wrap and unwrap as needed. 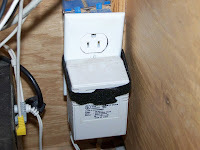 When we were done, she said we still need to do something about the power brick for her speakers--It is large, and falls out of the plug fairly often, especially when the dogs lie under her desk. Velcro ties to the rescue! Poke a hole in the tie, run the screw for the cover plate through, and reattach the cover plate. Wrap the ends of the velcro around the heavy brick, and the dogs can't knock it loose anymore.